It’s summer – give the posties a cricket bat and tell ’em to get on with it. Box by the road. How hard can it be? We would “take up a collection” or start a “relief fund”. The tonterías are always the most fun but the hardest to do in another language. I’ve never seen a mailbox by the road in England, come to think of it. They don’t do it. I ought to say, I just matched a picture I found via google to the story; they aren’t really connected. I think Muntz could take him. Eso! that’s it! Thank you, Nijma. What did you google? “Cat in hat”? “Cat space trooper”? “Cat wearing citrus fruit on head”. No, I just googled “old cat”. Yes, Julia’s daughter, the picture is nuts. 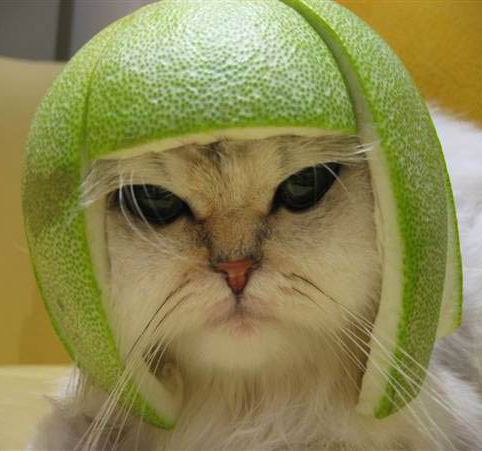 The poor cat looks cross, and so would I if someone put a grapefruit on my head. Our best wishes to you, from Norway. Since this is a Norwegian blog, shouldn’t there have been horns on that helmet? They say up here that the Viking helmet with horns is a modern invention – or, at least, no one’s ever found a genuine one. Well, that’s because they don’t look in cat graves, obviously. Thank you, AJP. Best wishes for you from down here! Off topic (parental pride is a powerful force! ): at my blog (April 7) you can see and hear my son making music. Playing a song by Nick Drake (very well). An April 1st news article in the Council for British Archaeology revealed Vikings may have worn horned helmets after all. It is clear that the helmet was worn with one horn up and one down. Equally important is the fact that it was worn fore and aft not side-to-side, as the front horn was worn down to provide a nose guard. These guards in metal are clearly portrayed on the Bayeux tapestry on the Normans (who were themselves descended from the ‘Norse Men’). In the past people were shorter, so the rear horn pointed upwards so that the Vikings could find one another in long grass. By 1066 the rear horn was unnecessary as the Normans rode horses (again evidenced in the Bayeux tapestry) and so were now visible in all situations. I thought those details seemed rather peculiar. The date had something to do with it. I imagine they could detach the horns, one for drinking from, and the other for sounding the advance on. What the cats did with them I don’t know. I think I’d rather wear my front spike turned up, not down, at least when charging the enemy. The rhinoceros look? More manly, anyway. Then there are those old German helmets with one spike on top. I have sometimes wondered what the spike was for. Purely decorative, it seems. And too eye-catchingly shiny for actual war: at some point the decision was made to fit them all with Überzüge of cloth. They used to sell those old German spiked helmets in the Portobello Road when i was young. I always wanted one (I had a military hat collection). Some of them were very elaborate and some, maybe Austrian, had plumage – the spike may be a plumage leftover. I noticed that at yesterday’s Grand National, we no longer have the splendid Liverpool mounted coppers in antique uniforms to accompany the winner to his enclosure. When was that omission introduced? Shame! My daughter & I would love to watch the Grand National on tv, but I can never get hold of it. Yes, it was for plumage, not for lowering your head and charging the enemy like a monoceros. Or for being shot at something as a human cannonball. Or for storing olives. Did I ever tell you the one about the day the human cannonball announced his plans to retire after years of working at the circus? I remember that cat! Several years ago the story of the grapefruit helmet made the Internet rounds. As I recall, it started with a bored young man who had too much to drink, and ended with a cat in a fruit helmet. Maybe that’s why I found it by googling “old cat”.